Artificial flavorings and the “Flavor Makers” – Did you have any idea? For an even more disturbing piece of the puzzle, read Dr. Mercola's article on a part of the process that is so sick, sad, and shocking that it makes me want to vomit. Next time the kids ask to buy some gross junk food, I'll show them this video. Sorry to do this to you on a Sunday. We have avoided all artificial sweeteners, high fructose corn syrup, natural flavors for a long time. But… it is almost impossible to avoid it entirely (eating a friends or other family’s homes, eating out, etc.). What is natural? No one has really defined that… so it really doesn’t mean what most Americans think it means. Thanks for sharing this great video. My kids are definitely watching it, as it will help solidify in their minds why we eat the way we do. Well, I’m officially disgusted now. We rarely use convenience foods in our home and I always steer clear of “natural flavors” anyway (lots of food allergies over here in this household! 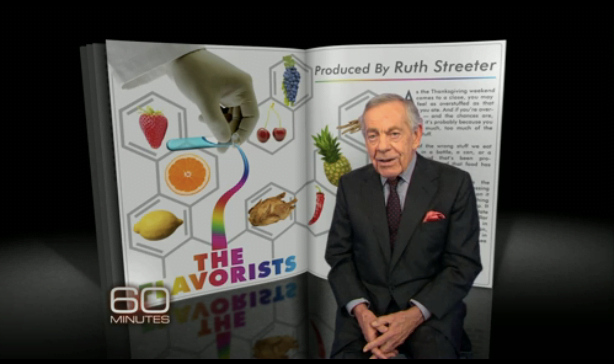 )…BUT…I had no idea that this is what they are doing to make the natural flavors. YUCK! I”ve scheduled to share this tomorrow on my Facebook page. Thank you so much for this, Kelly! Thanks for that tip, Kelly. I agree with some of the others. The ONLY way to be sure what you are eating is good is to go for the basics. Just forget buying ANYTHING in a box, can, jar, etc… In other words if it has more then a few ingredients leave it at the store, it’s just cancer in a can. I would be willing to one;s grocery bill would be less going this route. Yes prep time is going to go up, but aren’t we worth a reorganization of out time in a way that is mindfully healthy for us? Would you post the actual link please? The video is not playing all the way through, thanks. Chris, click the “here’s the transcript” link and you’ll find it there. Thank you for posting this (even on Sunday!). I’m sharing both the CBS video and Dr. Mercola’s article, to help spread the word. We avoid even natural flavors because it is a way to hide MSG. I wonder – does this include organic products too? What about if a product lists “natural vanilla flavor” (or lemon etc) – Is it really natural vanilla?? Thank you for bringing this to our attention. I will have my older kiddos watch this today. The more they watch the more sinks in. I have watched my 9 year old son over the last 2 years thinking more and more with his head verses taste buds. When I can’t belive it’s not butter is offered he politely says no thank you and just eats the bread plain. One battle of awareness down now just have to work on the properly prepared grains…that can be hard to do on vacation though! Regardless of where someone is on the pro-life/pro-choice debate, this should disturb everyone! Truly, the value of human life has disintegrated, as well as ethical consideration, among these companies! We all need to share this article to get the word out. Oh, my!! That is so disturbing.